The 2018 Chevrolet Equinox offers crisp styling and solid utility, but at what price? It’s still early in the year, but the redesigned 2018 Chevrolet Equinox—the brand’s entry in the competitive small crossover segment—is already the fifth best-selling vehicle in America. There’s little doubt that its crisp new sheetmetal and all-turbo engine lineup have a lot to do with the Equinox’s newfound popularity, although I suspect Chevrolet’s $199 per month advertised lease offer plays a role as well. Ron Westphal Chevrolet stocks many new 2018 Equinox along with late-model pre-owned models. Call us now at 630-898-9630. Chevrolet has already sold more than 2 million examples of the Equinox in its former guise. But going without a redesign for eight years, or a significant upgrade in terms of technology, meant that consumers increasingly chose Honda’s CR-V, Nissan’s Rogue, and Toyota’s RAV4, flocking to those models in greater numbers. Now, the manufacturer that once offered the public such commuter classics as the Nomad, the Chevelle, and the Nova has a chance once again to vindicate itself against unrelenting competition. Built on the General Motors Theta platform—the same used for the slightly more upscale GMC Terrain—the new Equinox shares styling cues with the new Traverse, its larger stablemate in Chevrolet’s crossover lineup. Translated, that means it is visually appealing. Back in 2014, when Chevrolet introduced the seventh-generation Corvette, Ed Welburn, GM’s global design chief, promised the sports car’s angular styling would make its way to cars like the Malibu, Cruze and Volt. GM kept Welburn’s promise, and finally carried the bold creases and angular forms over to the Equinox this year, giving it a more aggressive, modern look. The redesign went more than skin-deep. The interior is all new, too, and Chevrolet says the new Equinox has shed 400 pounds over the outgoing version. It’s also now available with low-speed automatic emergency braking, a 9-speed automatic transmission and a diesel engine option, although these upgrades add quite a bit of cost to a vehicle that should be, in theory, an economically-priced model. Inside, Chevrolet gets an A for execution. Dash panels and instruments come together nicely and even hint at quality craftsmanship. The hinting fizzles when your eyes see and fingers touch the materials used to complete the job. Cheap-looking plastic abounds, and gives the vehicle’s interior a feel that I would call “Uberey.” In fact, sitting in the back seat, it’s not difficult to imagine the Equinox being the ride you last hailed to the airport. Comfort-wise, the new Equinox is good, but with a few caveats. The seats—especially the front ones—are supportive and well cushioned. For larger drivers, the stall formed by the driver’s-side door and the center console may be a bit narrow. I’m small and it was a good fit, but I could see someone larger wanting more lateral legroom in the driver’s side front foot well. Additionally, the Equinox has tall doors, or short windows, depending upon how you look at it. The result is an interior atmosphere that recalls a World War II-era pillbox (although not to the extent of the Camaro, which has windows that are practically slits). Despite a dark back row, the Equinox’s rear seats are roomy, with plenty of head and legroom. My favorite aspect of this vehicle is its practicality. At 29.9 cubic feet with the rear seats up and 63.5 cubic feet when they’re folded flat, the Equinox’s cargo volume is among the lowest in its class. But numbers aren’t everything. The way the rear cargo space is configured—with a long, wide floor—makes it easy to put a lot of stuff back there. Interior controls are simple and easy to use. All Equinoxes come standard with Chevrolet’s MyLink infotainment system, which includes Apple CarPlay and Android Auto compatibility. The color touchscreen in the center of the dash is 7 inches on lower-end models and 8 inches on higher-end models, including the Premier 2.0T I tested. OnStar—GM’s mobile service provider—comes standard as well, and includes automatic crash assistance and navigation features. Customers will have to shell out anywhere from $20 to $35 per month for basic service after the 3-month free trial period ends. Wi-Fi is an add-on to OnStar, and can cost anywhere from $10 to $40 per month more. Sirius XM satellite radio is available on all but the lowest two trim levels, and adds another $10-$20 per month in service fees. Dual-zone climate control, heated seats and a heated steering wheel are optional, as is the Bose 7-speaker premium sound system and panoramic sunroof. These options come as part of expensive equipment packages, though. The hands-free power rear liftgate is an available option on the top trim levels. The National Highway Traffic Safety Administration awarded the new Equinox four out of five stars in its safety ratings. High-tech safety features like low-speed emergency automatic braking, a blind spot warning system and a following distance indicator—all connected to the driver via an ingenious vibrating seat device—are only available on the top trim levels. A teen driver mode that allows parents to track driving habits and limit certain vehicle features is standard equipment on all models, as is a rear seat reminder system. Chevrolet decided to go with small-displacement turbocharged 4-cylinder engines for 2018, and is offering 1.5- and 2.0-liter gasoline engines and a 1.6-liter diesel. Transmission options include 6-speed and 9-speed automatics, both equipped with a “manual” mode that allows the driver to select gears on the fly. As with other Chevrolet models, the selector button for that mode is mounted in a puzzling place—atop the shifter handle, where it is almost impossible to reach without craning your hand into a carpal tunnel-inducing fold. The Premier 2.0T I tested came with a 252-horsepower, 2.0-liter turbo four cranking out 260 pound-feet of torque with a very usable 2,500 rpm to 4,500 rpm range. Mated to the 9-speed transmission, it offered smooth, sprightly acceleration—more than adequate for anything you’re likely to encounter on public roads. The standard four-wheel-disc brakes are responsive, as is the electric power steering. The EPA fuel economy rating for the 2.0T is 22 miles per gallon in the city and 28 on the highway, for an average of 24 mpg. On my test drive, which consisted of 60 percent highway and 40 percent city driving, fuel economy stayed right at 24 mpg. Compared with similarly equipped competitors like the Honda CR-V with a 1.5-liter turbo (29 mpg average), the Nissan Rogue with a 2.5-liter naturally aspirated 4-cylinder (27 mpg average), and the Toyota RAV4 with a 2.5-liter naturally aspirated four (25 mpg average), the Equinox 2.0T ranks last in efficiency but first in power. Fans of the Chevrolet small crossover who are concerned about fuel economy can stick with the less powerful, less expensive standard 1.5-liter turbo (26 mpg average), or the 1.6-liter turbo-diesel (32 mpg average). The Equinox has less cargo volume than other models in its class, but the way the space is configured is more usable. With its fresh styling, utilitarian cargo hold and—in 1.5-liter gasoline and 1.6-liter diesel offerings—competitive fuel economy numbers, the Equinox is an appealing alternative to other small crossovers. In base trim, its sub-$25,000 price is attractive, too, although at that level, you aren’t getting all-wheel drive or any colors other than silver or white. Options like all-wheel drive and brighter colors push the price past $28,000, and with heated seats and different engine and transmission options, the sticker can quickly shoot beyond entry-level SUV territory. The Premier 2.0T I drove had a sticker price of more than $37,000. Despite the fact that I genuinely liked its look and feel, in my opinion, that’s too much to pay for an Equinox. Though Chevrolet’s design department cranked out a solid set of upgrades on this year’s model, it felt like I was being tricked into thinking a basic crossover was nicer—and worth more money—than it actually was. Mostly, it was lack of attention to detail with regard to the little things: the cheap, hollow thud when I closed the doors; the awkward manual shift selector toggle switch; the chintzy dash and door panels. But it was enough to convince me that there was better value to be had in a compact crossover from another car company. If you would like to see or drive a brand new Equinox, call Ron Westphal Chevrolet in Aurora, IL at 630-898-9630. Or, visit our website anytime. Thanks for reading this article about the 2018 Chevrolet Equinox. February is coming to an end soon and so are these great Chevrolet Incentives on new 2018 models. Ron Westphal Chevrolet’s website is currently displaying over 165 different February Chevy incentives. Some are compatible with others, some are not. The available savings are can be enornous right now, but it is difficult to keep track of all available cash back programs. And you may qualify for additional non-advertised GM incentives! Please don’t hesitate to contact our Customer Care Team at 630-898-9630 for details, information and program compatibility or visit our website 24/7. Trax, Equinox and Silverado Crew Cab models all have extra rebates corresponding to the Chicago Auto Show. Trax has Auto Show Bonus Cash, Select Market Cash and a GM rebate. The LT models also have lead brand bonus cash. Equinox has Auto Show Bonus Cash, downpayment assistance and a GM rebate. The LT models also have Lead Brand Bonus Cash. Silverafo has Auto Show Bonus Cash, GM rebate, Lead Brand bonus cash and package cash available. Some of our Silverado models have total savings of over $13,000! Chevrolet Trax is offering 0% financing for up to 72 months AND $1000 Cash Back! Equinox is offering 0% x 60 or 0.9% x 72 months for qualified buyers. 0% x 72 months is available on Silverado 1500 Crew Cab models. 0% x 60 is available on all other Silverado models. Colorado is offering 0% x 60 or 0.9% x 72. Cruze models are offering 0% x 72 AND $1000 Cash Back. Malibu is offering $500 Cash Back AND 0% x 72 months. Chicago Auto Show Bonus Cash is Ending Soon. We hope you are able to take advantage of these great offers. *All pricing is plus tax, license and fees. Low O% financing is usually reserved for well-qualified buyers. Leasing incentives vary. See Ron Westphal Chevrolet in Aurora, IL for complete program terms and information. We are located in Aurora, IL near Plainfield and Naperville on the corner of Routes 30 and 34. Our recently renovated dealership is in Kendall county, IL. We hope to see you soon! 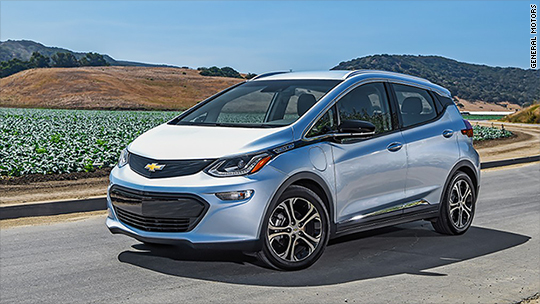 The Chevrolet Bolt EV got a strong head start against the Tesla Model 3 in the marketplace and now it has an early nod from Consumer Reports magazine which named the Bolt its “Top Pick” among small hybrids and electric cars. The Bolt beat out other cars in its category such as the BMW i3, Ford Focus EV and the Chevrolet Volt plug-in hybrid. It also beat the Toyota Prius which had been named Top Pick in this category in the past. “The Bolt offers consumers further proof that mainstream electric cars can deliver strong driving performance,” the magazine said in an announcement. The magazine hasn’t completed testing on the Tesla Model 3, which has a similar starting price to the Chevy Bolt EV. Base models of both start around $35,000. Tesla has struggled to begin volume production of the Model 3, though, and, for now, is only building fairly expensive, highly equipped versions of that car. Consumer Reports also hasn’t yet finished testing the the new version of the Nissan Leaf, which is even less expensive than the Bolt but has a shorter driving range. Consumer Reports named Top Picks in 10 different vehicle categories. To earn a Top Pick, a vehicle must get the best score in its class in Consumer Reports’ tests and also have at least average reliability based on the magazine’s surveys. Chevrolet was the only other brand with more than one car earning Top Pick status from the magazine. Besides the Bolt EV, the Chevolet Impala was named the magazine’s Top Pick among large cars. It provides “a driving experience akin to a luxury car,” the magazine said. Looking for a Chevrolet Bolt? Call our Customer Care Team at 630-898-9630 or visit us online anytime. Thanks to Nicole and family! We know you are going to love your new Chevrolet Trax! We both feel better having you behind the wheel of a dependable vehicle. In case you haven’t heard, sinkholes aren’t the only threat to the Chevrolet Corvette. Sales of the quintessentially American sports car have dwindled recently, leaving some to wonder whether the ‘Vette was headed towards its own extinction level event. That’s probably not going to happen, but it remains true that the C7-generation Corvette is criminally under-appreciated—especially considering how it can stack up against—and even defeat—some of the finest supercars Europe can offer. Looking for your own Z06? Call our Customer Care Team now at 630-898-9630 or visit our website anytime. All right, so half of you reading this are rolling your eyes, while the other half are cheering “hell yeah” and high-fiving a bald eagle drinking a Bud Light. But don’t take it from us—instead, check out this head-to-head battle between an $80,000 Chevy Corvette Z06 and a $160,000 Mercedes-AMG GT R staged by Sport Auto on a racetrack in France. Spoiler alert: The Corvette Z06 punches far above its price point. Despite one costing twice as much as the other, the two have more in common than one might think at first. They’re both two-seat sports cars with big engines sending power to the rear wheels. The AMG is obviously a little fancier and features a dual-clutch transmission and active rear steering, but the 6.2-liter supercharged V-8 (650 hp, 650 lb-ft of torque) in the Z06 is actually more powerful than the smaller twin-turbo V-8 (577 hp, 520 lb-ft) in the Mercedes. Riding on identical Michelin Pilot Sport Cup2 tires, the two squared off in damp conditions on a track called the Ring of the Rhine in France. In the end, the Corvette actually came out on top by two-tenths of a second with a blistering 0:58.12 flying lap, despite the driver having to wrangle its old-school seven-speed manual transmission. Even more impressively, the ‘Vette is just six-tenths of a second off the time set by a Lamborghini Huracan Performanteon the same track. There’s just one caveat. In an identical test between the Mercedes and Chevrolet conducted by Sport Auto last year at the Hockenheimring in Germany, the AMG came out on top. So while there’s some variance in the result depending on the track, one thing’s for sure: The Corvette is still one of the better performance deals out there. Did you know GM has a plant in South Korea? The GM Bupyeong facility, sometimes referred to as the Bupyeong Complex, is located in Bupyeong-gu, Incheon, Korea (South Korea). Did you know GM has a plant in South Korea? Seeing as the Olympics are going on in South Korea right now, maybe you would be interested to know the GM Bupyeong facility, sometimes referred to as the Bupyeong Complex, is located in Bupyeong-gu, Incheon, Korea (South Korea). It serves as the headquarters and R&D Center of GM Korea and currently produces various Chevrolet, Buick, Opel and Vauxhall vehicles as well as Propulsion Systems. The Bupyeong facility is a living piece of Korea’s automotive history, as the plant was the first modern automotive factory in the country. It produced the world’s seventh diesel passenger car in 1985. Interested in Chevrolet? Visit our dealership today, Call our Customer Care Team at 630-898-9630 or drop by our website anytime. Thanks for reading Did you know GM has a plant in South Korea. Author WestphalChevyPosted on February 16, 2018 February 12, 2018 Categories NewsTags GM has a plant in South Korea, ron westphal chevrolet blog, Westphal Chevy BlogLeave a comment on Did you know GM has a plant in South Korea? The new year did not change the shift consumer preference. If you are still interested in cars, how about the Chevy Cruze? It’s awesome and we’ve got an excellent selection at Ron Westphal Chevrolet. Call our Customer Care Team now to set up your V.I.P. consultation or browse our website anytime. Chevrolet Trax sales numbers for January are impressive! The Chevrolet Trax is a subcompact crossover. It slots below the Equinox as Chevrolet’s smallest CUV and rides on the GM Gamma 2 platform shared with the Chevrolet Sonic/Aveo and Buick Encore. The model was Chevrolet’s first offering in the subcompact (B segment) crossover space and the second (after the Nissan Juke) to launch in its segment in the U.S. market. Call our Customer Care Team at 630-898-9630 to arrange your V.I.P. Chevy Trax consultation. Or, browse our website 24/7. Having launched for the 2015 model year in the U.S., the Trax received a refresh for the 2017 model year that consisted of all-new front and rear fascias, the replacement of the LTZ trim by the new range-topping Premier model, revised interior, a new infotainment system with Apple CarPlay and Android Auto compatibility, and more. The 2018 Chevy Trax represents the fourth model year of the first-generation Trax and receives several changes including three new exterior colors, a new Trax Redline Edition model, and several equipment-level changes. The Trax is built at two assembly plants — the GM Bupyeong factory operated by GM Korea and the GM San Luis Potosi factory operated by GM Mexico. The vehicle is called the Chevrolet Tracker in some markets, including South America and Russia. Why not take delivery of a new Chevy this Valentines Day? After all, what’s better than a presenting a sweet, new ride to your better half on the most romantic day of the year? We’ve got a wide selection of brand new and late-model pre-owned GM Certified vehicles guaranteed to melt your heart. And, with the Auto Show incentives going on right now–Valentines Day is the perfect day to take delivery of your next vehicle. Whether you want a sleek car, a sporty SUV or a Crossover for your family, we have the Chevy in stock that fits the bill perfectly. Call our Customer Care Team now at 630-898-9630 to arrange your V.I.P. consultation. Take delivery of a new Chevy this Valentines Day. We have giant bows and can arrange for home delivery. Feel free to browse our extensive inventory online at www.WestphalChevy.com. Ron Westphal Chevrolet is a recently renovated Chevrolet dealership with over 400 vehicles in stock to choose from. Located on the corner of Route 30 and Route 34 where Aurora meets Oswego, IL.